Jalur Gemilang (Malay text only) with much information on flag sizes, protocol etc. I came across an official Malaysian Year Book in my local library and it had 'official' descriptions of the Malaysian national and state flags as well as description of armorial ensigns, state emblems and other information like state anthems, history, rulers (as in 'sultans') etc. The Malaysian National Flag consists of fourteen red and white stripes (along the fly) of equal width, a union or canton of dark blue, a crescent and a star. The red and white stripes stand for equal status in the federation of the member states and the federal government. The union or canton of dark blue represents the unity of the peoples of Malaysia. The union contains the crescent which is the symbol of Islam, and the star, the 14 points of which symbolise the unity of the 13 states of the federation with the federal government. The yellow of the crescent and the star is the royal colour of the Rulers. The 14 stripes on the Malaysian flag represent the 14 states of Malaysia (Perlis, Kedah, Perak, Kelantan, Terengganu, Pahang, Johor, Malacca, Negri Sembilan, Selangor, Penang, Sabah, Sarawak and the Federal Territories of Kuala Lumpur and Labuan). The blue square represents the harmony of the people. The crescent symbolises Islam, the national religion and the colour yellow is the colour of royalty. The dark blue stands for the unity of the Malaysian people. The crescent moon is a symbol of the official religion Islam. The 14 pointed star symbolises the unity of the 13 states and the federal government. The yellow is the colour of Their Highnesses the Rulers of the Malay States. The rules for flying flags seem to be the same as in the UK, etc, except that in Malaysia state flags are flown in the honour position at state events and on state holidays. Also, the order of state flags is according to the precedence of their Rulers, which is according to seniority, sultans/rajas then governors. o The US was the post war hero, liberators and role model to the world on many fronts with a great federalist flag. The star has 14 pointed tips The symbol of equality and strength in unity is reflected in its design. On the Malaysia Government`s Official Portal, on the web-page about the Malaysian Flag and Coat of Arms is written, "The canton of dark blue in the upper quarter next to the staff and extending down to the top of the fifth stripe". I guess that this is a matter of how you count the stripes - I guess that they count only red stripes as "stripes" in this counting. The protocol manual for the London 2012 Olympics (Flags and Anthems Manual London 2012) provides recommendations for national flag designs. Each NOC was sent an image of the flag, including the PMS shades, for their approval by LOCOG. Once this was obtained, LOCOG produced a 60 x 90 cm version of the flag for further approval. So, while these specs may not be the official, government, version of each flag, they are certainly what the NOC believed the flag to be. For Malaysia: PMS 286 blue, 485 red 109 yellow. The vertical flag is simply the horizontal version turned 90 degrees clockwise. Smith 1980 [smi80] says, "Blue was chosen for the Malaysian flag to show its association with the Commonwealth (...)". Pedersen 1971 [ped71] is more specific, "Dark blue is from the British flag and symbolizes the connexion with the Commonwealth". I noticed that two recent books, Dorling-Kindersley 1997 [udk97] and Znamierowski 1999 [zna99], have dropped the connection with the Commonwealth. I would not be surprised if the change in the 'meaning' of the blue colour were associated with the accession of Mahathir Muhamad to the power in July 1981. Mahathir has developed a nationalistic ideology and would like to be the 'champion' of South-East Asia. This could explain that the reference to the British Commonwealth was discarded. The colour blue on the flag may have represented the Commonwealth originally, but this is not the case now. Blue symbolises unity or perpaduan in Malay. Malaysia is a federation of monarchies and a member of the (British) Commonwealth. The use of red and white stripes to represent a federation is clearly a United States innovation, but early U.S. flag designers probably got the idea of red and white stripes from the flag of the British East India Company, whose ships were frequently seen in American ports. The Straits Settlements were an East India Company protectorate, and I suspect that the stripes on the Malaysian flag make reference to both their federation and their history with the East India Company. The derivation of the US flag from the East India Company flag is widely posited but also disputed. It is, as I understand it, not true that East India Company ships were frequently seen in American ports, at least not flying the 'gridiron' flag. Also, the Straits Settlements did fall under the East India Company, but not after the company was dissolved in 1858, 105 years before the Malaysian flag was adopted. Absent any legislative history supporting this theory, it seems to me less persuasive than the hypothetical connection to the Stars and Stripes. The very construction of the Malaysian flag, with its much larger blue canton [cf. the Johore war ensign], is virtually a denial of US influence. Whether the red-and-white stripes in the Malaysian flag can be derived from the East India Company is a moot point, but the popularity of red and white in the East Indies (Malaysia and Indonesia [cf. for instance the Indonesian jack]) predates any influence on the part of either Britain or the United States. Red and white are part of the traditional colours of the Malagasy people, too, remember  a people whose origins are in Borneo. The flags of the MCA is blue field with a yellow sun. The MIC flag is red and white stripe with MIC in Tamil and English at the centre. Now merge these two flags - the MCA flag on the canton and the MIC flags without the blue stripes on the fly. The crescent moon on the canton represent Islam hence the Malays. At a Penang state track and field meet was last week I met an elderly gentleman (Mr. Ibrihim). He introduced himself and then began to ask questions about me...and after a while, he pointed to a Malaysian flag and asked me if the flag made me feel "at home" in any way. He then said that he was asking the question from a flag similarity standpoint. Surprisingly, he then said; "We intentionally copied the American flag you know." I said; "Really? How so?" He said that in those days, there was a good deal of positive sentiment about the US and that the newly independent Malaya wanted to mimic the US form of government in as many ways as possible. They wanted to draft a constitution that was similar to that of the US and they were hopeful that they would develop as a nation as successfully as America had. Additionally, he said that the Malay were grateful for US intervention during WW II while also quietly encouraging the British to "let go" after the war ended. He said that the US flag serving as inspiration for the design of Malaya's flag was a natural sort of process and simply seemed like "the way to go." I was amazed that I was getting to listen to Mr. Ibrihim's story and asked him how he knew all of this. He then let me know that he had been a Malay state representative from Penang during and right after independence came along. About that time, I had to excuse myself and said that I would return in a few minutes. When I got back to my seat, Mr. Ibrihim was gone. I never got to probe further relative to his story. I hope to track Mr. Ibrihim down soon. Malaysia: The government of Prime Minister Datuk Seri Dr. Mahathir Mohamad has introduced many changes into the economic, political and social systems of Malaysia. On the 40th anniversary of the country's independence, 31 August 1997, provision was made for an official name for the national flag. The version chosen, Jalur Gemilang, combines a Malay word meaning "stripes" or "range of values" with the adjective ("gemilang") signifying "glorious". No change was introduced in the design of the flag. A vertical, swallow-tailed Malaysian flag was shown in a TV documentary. I don't know how official it is, but it was hanging outside the Petronas Towers--a position of that visibility may mean something. Sometimes seen is a typical Malysian national flag, except that the bottom white stripe wis abnormally wide, perhaps twice as wide as the others, maybe a bit less. There are lots of those type Malaysian flags flying here and there. They are printed cotton broad cloth and come in all sizes. Whoever makes/made them will simply get their screens a bit too narrow for whatever width they are trying to print. Usually the manufacturer is working with a piece of material that is pre-woven with tapered locked edges. That way, the flags do not have to be hemmed on the top or bottom. So, all they do is print, hem the fly and hoist and sell. Malaysia is really a good place for flag spotting. Flags are almost all over the place and not only the Malaysian flag but also all 14 states flags. People put little flags on their cars or inside their cars, they also use stickers with Malaysian flag and inscription 'Proud to be Malaysian' and so on. If you visit Kuala Lumpur you must go to the Merdeka Square and see one of the tallest flag poles in the world (100 metres). The Union Jack was lowered at midnight on August 30, 1957 and the Malayan flag hoisted up for the first time. It is really magnificent. There are Malaysian and Federal Territory flags in front of the court building and all 14 states flags under the huge pole. The flag is really big and it's really great when you see it from different parts of the city. 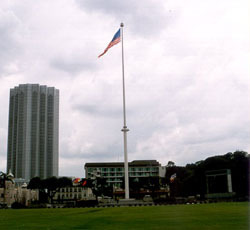 Here is a little picture of the Merdeka Square with the tall flag pole. Kota Kinabalu: Fifty-eight students from Universiti Putra Malaysia (UPM) 10th College and Kolej Ibukota Kinabalu (KIK) fought coldness and fatigue to unveil Malaysia's largest Jalur Gemilang (national flag) on the summit of Mt Kinabalu last week. On Thursday, they once again unveiled the 118m x 77m flag at the KIK main campus football field in an attempt to enter the Malaysia Book of Records. Strange dimensions, 118m x 77m, giving a proportion of (almost exactly) 13:20, as opposed to the official ratio of 1:2.